BMRC (Bangalore Metro Rail Corporation Limited) has issued notification for recruitment of 69 Engineers, manager’s posts. All eligible and interested candidates can apply offline later than 21-02-2015 (21 February 2015). 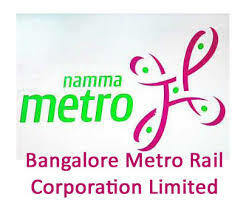 More detailed information on age limit, educational qualifications, the selection procedure, Pattern of the examination syllabus for BMRC (Bangalore Metro Rail Corporation Limited) Recruitment 2015-69 engineers, managers Post is mentioned below. Candidate’s age limit should not exceed 50 to 55 years. Age relaxations will apply according to the rules. Candidates must have done Diploma / BE / B.Tech / engineer / M.Arch / B. Arch / ME / M.Tech or equivalent qualification from a recognized university. All eligible applicants will be selected based on their performance in the written test, Interview. Salary Range: Rs 30000/-to 80,000/-. All eligible and interested candidates are required to send their hard copy of the application and the relevant evidence to the following address on or before 21-02-2015. Last deadline for receipt of application forms is: 21-02-2015.